Mumbai/ Delhi, March 9, 2013: Aviva’s brand strategy, based on the father-child relationship, highlights the importance of a father’s role as a protector in his child’s life, whether financial, physical or emotional. With an objective to help young fathers realize the importance of financial planning for their children’s secure future, Aviva India unveiled its social media strategy today based on creating and feeding engaging content in the social media channels. The core of the content onion will focus on protection related content drawing analogies from cricket; the next levels will cover content on financial literacy, products and parenting for young fathers. This will be supported by a robust digital advertising campaign to promote content to our target audience – young parents in the age-group of 28-44 years. Aviva is already among the top players for its online protection plans and with this launch, they expect to further consolidate their position in this category. Through the new campaign – ‘Padding up with Sachin’ and ‘Sachin Off Guard’, launched today, Aviva aims to further strengthen its association with fatherhood and protection. 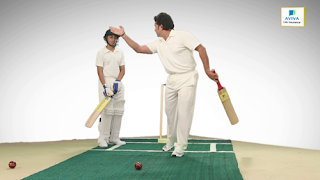 These are a series of webisodes on cricket tutorials and interviews on importance of protection by Aviva’s Brand Ambassador and the Master Blaster – Sachin Tendulkar. For the first time ever, netizens will have access to innovative, inspirational and conversation like tutorials on cricketing by the Little Master himself. With 73% of audience on social networking sites consuming video/ entertainment on the site, Aviva sees an increase of three fold in its engagement scores in its social media channels like Facebook, Twitter and Youtube leading to higher awareness on Aviva’s offerings. Aviva is shortly releasing its ‘Product Center’ and a series of engaging product related videos on Facebook to further enhance the same. Aviva’s Brand Ambassador, Sachin Tendulkar said, “Cricket is my passion and I am delighted to partner with Aviva to launch the 'Padding up with Sachin' tutorials. These webisodes which showcase my successful moves on the pitch, will give fathers a chance to view and coach their children. The links to these videos will also be available on my Facebook page as well and I invite all to view and share the same". Adding further, Rishi Piparaiya, Director Marketing and Bancassurance, Aviva India, said, “In an age where the internet is about content consumption and engagement, pure play product messaging only disrupts the consumer’s natural web behaviour. This is where we believe that we have bucked the trend by using content creation, rather than content disruption, as an approach. Testimony to this is the fact that we have crossed 1 lakh likes on our Facebook page in a short span and achieved a high engagement score on Twitter. Market Research by a leading kid’s channel highlights that Sachin Tendulkar is the leading sports icon for both boys and girls and cricket is among the most popular sports in India. Hence through the Padding up with Sachin series, Aviva seeks to provide a unique opportunity for fathers to train and engage with their kids. The first webisode to be released in the series is on Sachin’s signature shot – Straight Drive. (http://bit.ly/12z3KfO). The next series to be unveiled shortly will be on his other signature moves like Cover Drive, Pull Shot and Square Cut and will be released basis audience poll through contests in social media.